Back in the late 70's we used to have a phrase for executives and middle managers who picked up Apple II computers and the first spreadsheet, Visicalc: Visicalc Dreaming. Read the full article on sansmirror.com. The X-Pro1, X-E1, and X-E2 get firmware updates. Full article on sansmirror.com. Substantial film price increase coming from Fujifilm in April 2014. Franiec Grip for Panasonic GM1 Read the article on sansmirror.com. When the press release came across my desk this morning, I stared at it for a long, long while. Read why on sansmirror.com. Uwe Steinmueller's new iOS product. Read the full article on dslrbodies.com. The details on the 10-24mm XF lens have been announced. Read the article on sansmirror.com. Database page. Today Samyang announced that they've reworked five of their lenses for direct compatibility with the Sony E-mount cameras, including the A7 and A7r. Read the article on sansmirror.com. Okay, something interesting is going on in DX. We have had four different 24mp DSLRs from Nikon without the same exact sensor sitting behind the lens. Read the full review on dslrbodies.com. More so than any review I've ever written I can see that some people will buy the Df despite what I write, while others will avoid it because of what I write, and both could be wrong in doing so! Read the full review on dslrbodies.com. If you're looking for the category star ratings that used to appear in my reviews, they're kept here now for current Nikon DSLRs. Dec 13 Fujifilm X20 Review — The X20 is another in the Fujifilm's X series retro styled cameras that appeal to those looking for more traditional controls and camera style. Read the full review on gearophile.com. Dec 13 Sony RX10 Review — Sony is on a tear with new cameras, and the curious thing about the RX series is that they all take a very different attack on the compact camera market. Read the full review on gearophile.com. Dec 13 Someone's Dreaming — Headline from Nikon's mass email today: "Check out the latest Large-Sensor Compact from Nikon." Should you? Find out by reading the full article on gearophile.com. Dec 13 Another Lens Vendor Appears — HandeVision today announced their first lens offering, a 40mm f/0.85 lens for the Sony E-mount (not FE), Fujifilm X, m4/3, and EOS M mounts. Read the full article on sansmirror.com. Data page for the lens is here. Dec 12 How Not to Create an Index — The new "CNET Hundred" list, which has the sub-description of "the top 100 products you should care about based on your clicks, our editors' scores, and more." Including cameras. Read my assessment on gearophile.com. Dec 12 Adobe Raw Converter and Lightroom Updated. Read the details on dslrbodies.com. Dec 12 Mirrorless Camera of the Year Nominees. Read the announcement on sansmirror.com. Dec 10 The Ecosystem Narrows — Besides upsetting Sigma lens compatibility, it turns out Nikon may be disrupting other accessory compatibility, too. Read the full article on dslrbodies.com. Dec 9 The Year Behind, the Year Ahead — Now that all the announcements for the year are behind us, it's time to take a look at what Nikon did for us this year. Read the full article on dslrbodies.com. Dec 9 Nikon D600 Review Updated to Include D610. Read the review on dslrbodies.com. Dec 6 The Question of Balance — Gizmodo's "Last Days of the DSLR" article is causing a lot of angst to show up in my In Box. But it's not just that article, it's virtually every article on the Web these days. Read the full article on dslrbodies.com. Dec 6 The DX Wide Angle — Samyang today announced the 10mm f/2.8 rectilinear lens. Read the full article on dslrbodies.com. Note: versions of this lens are available for most mirrorless mounts, see the data page. Dec 5 Optimal Data — Avoiding Entropy — Photography is about capturing data, manipulating data, and outputting data. Oh oh, I think I lost a few of you with that second item: manipulating data. Read the full article on dslrbodies.com. Dec 4 The Nikon Sigma Kerfuffle (updated) — Two new Nikon cameras, two service advisories from Sigma. Read the full story on dslrbodies.com. Dec 4 Why Japan/Asia Only? — With Canon announcing the EOS M2 only in China and Japan, the question I'm getting is why? Okay, here's the answer. 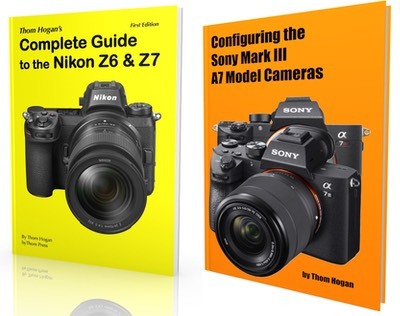 Dec 3 (Some) Books Are Back — CD and printed versions of Thom's Complete Guides for the D40, D40x, D50, D60, D80, D90, D300, D300s, D700, D3, D3s, and D3x are back, at special "while supplies last" prices. See the deal page on dslrbodies.com. Dec 3 Adobe has extended US$9.99/mo. Photoshop/Lightroom deal until December 31st. Dec 3 PrintTao and Perfect Photo Suite get updates. Dec 3 EOS M2 — The Japan-Only Game — Canon Japan today announced the long-rumored update to the EOS M, the EOS M2. Read the full article on sansmirror.com. Dec 3 Metabones and the Pocket Cinema Camera — Metabones has introduced a new version of its Nikon G Speed Booster, specifically designed for the Blackmagic Cinema Camera (0.64x) and Pocket Cinema Camera (0.58x) both of which use the m4/3 lens mount. Read the full article on sansmirror.com. Dec 2 Will the Pixel Madness Ever End? — The very first sensor I played with in a lab over two decades ago wasn't even capable of a VGA-sized image (480x640). Today, we've got DX sensors at 18mp (Canon) and 24mp (Nikon), and FX sensors that go higher in pixel count. Read the full article on dslrbodies.com. Dec 2 Siri the Would Be Photographer — Some of my Apple friends took me over to nearby Santa Cruz to show off some new photographic functions they’ve been working on. Read the full article on gearophile.com.